The figurehead of a new generation, the Altendorf F45 panel saw comes with a choice of three completely new control units, all of which enable you to control up to four axes from the centrally-positioned eye-level control panel. The Altendorf F45's new machine frame combines unprecedented torsion resistance with extremely low levels of vibration, while the smooth front and clear foot space on the floor enable you to operate closer to the machine and the workpiece. 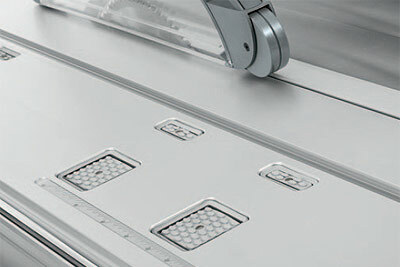 The famously smooth-running sliding table, featuring many new design tweaks, remains the undisputed benchmark for precision cutting. 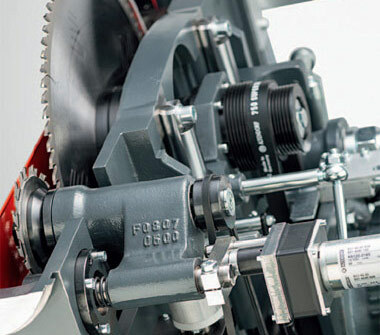 Complementing these impressive features is the eye-level control unit, to assist you in determining the height and tilt of the saw blade plus, depending on your choice of control package (covered in detail below), speed and other functions. 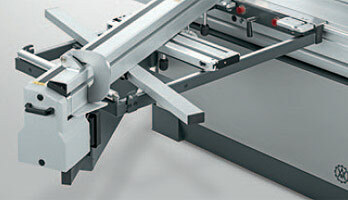 The sharp industrial design of the Altendorf F45 underlines the distinctive quality of the Altendorf brand. 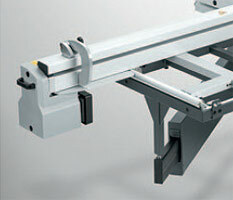 Our Altendorf F45 Configurator allows you to spec your machine and send it to us for a quick quote. A large screen is required to use it, so please visit this webpage on a large screen or tablet (in landscape orientation) to configure your ideal Altendorf F45! 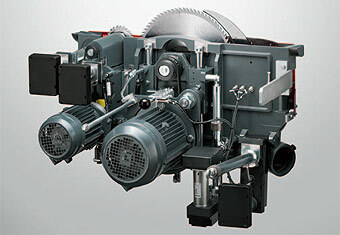 Motorised rise/fall and tilt adjustment (0 – 46°) for main saw blade with automatic cutting height correction when saw blade tilted. Sliding table, table length of 3000 mm. Rip fence with manual adjustment using graduated scale, includes fine adjustment and cutting width of 1000 mm. Crosscut fence with fixed 90° angle, manual adjustment using graduated scale up to 3200 mm. Maximum saw blade projection of 150 mm, maximum saw blade diameter of 450 mm. Motor rating 4 kW (5.5 HP), single speed (4000 rpm). 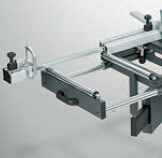 AKE tool clamping system for the main saw blade. Now you can wave goodbye to compromise! From now on you decide what features your new Altendorf F45 will have. Use our Configurator to view the options available to you, and send your ideal specification to us for a quick quote from our team. 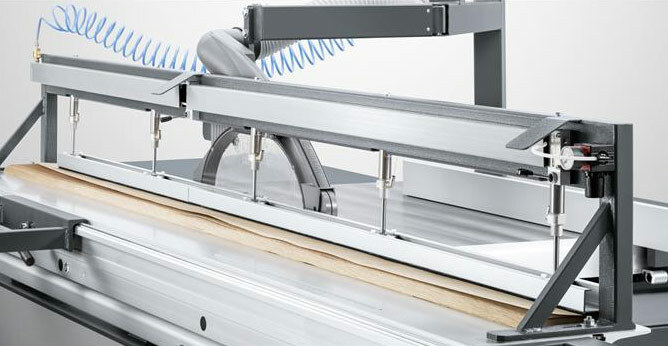 There are three control units available for the Altendorf F45, each of which will allow you to move up to four axes and tilt the saw unit – to either side. Explore each for a full understanding of their features. Control up to four axes and more. Efficiency-boosting features already on board. Choose between one-way and two-way tilting saw units. Do you require an extended cutting height? The motors are manufactured specially to Altendorf's specifications and have been optimized for use in sliding table saws. They provide up to 20% more torque than conventional electric motors with no increase in power consumption. The three-speed units operate at 3,000, 4,000 and 5,000 rpm and are adjusted manually. This drive offers infinitely variable speed control between 2,000 and 6,000 rpm. Matching speed precisely to the material increases not just cutting quality, but also the service life of your saw blades, which, in turn, helps to reduce your costs. 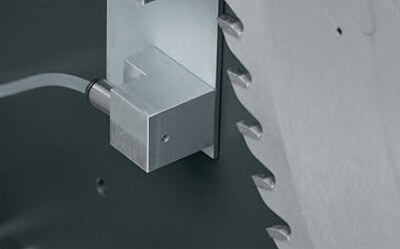 The maximum saw blade projection of 204 mm is achieved with a saw blade diameter of 550 mm. We recommend you choose the more powerful 6.5 kW (8.8 HP) motor. Which two-way tilt saw unit motor? The ability to tilt the saw unit up to 46° to either side makes the F45 an even more versatile cutting machine. 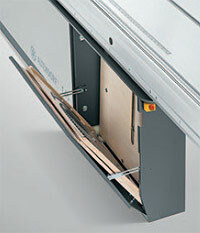 It saves time too - there is no need to adjust the extraction hood as it moves with the saw unit. The ability to tilt the saw unit up to 46° to either side makes the F45 an even more versatile cutting machine. It saves time too: there is no need to adjust the extraction hood, which simply moves with the saw unit, and the F45 completes the entire 90° movement, from full tilt on one side to full tilt on the other, in just 12 seconds. 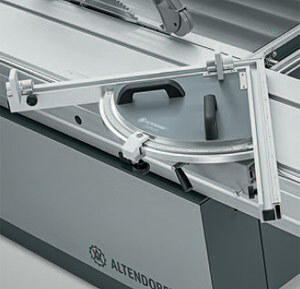 The new Altendorf saw unit features impressively robust tilt quadrants incorporating the traditional Altendorf tongue-and-groove connection system too, enabling it to tilt easily and with absolute precision just as you would be entitled to expect. The standard drive for this unit is a 5 kW (6.8 HP) motor with infinitely variable speed adjustment (VARIO: 2,000 – 5,000 rpm), but a more powerful 6.5 kW (8.8 HP) motor is available as an option. The synchronous servo motors fitted are up to 15% more efficient than conventional alternatives with a power reserve of up to 120%, which means peak power points of 11 kW for the 5 kW motor and 15 kW for the 6.5 kW motor. 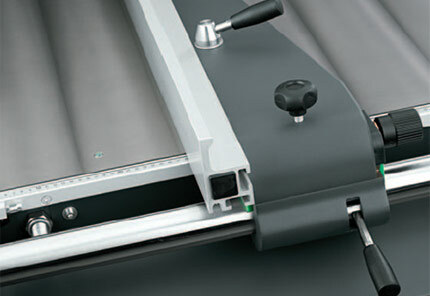 The Altendorf sliding table is renowned for its smooth, precise running. 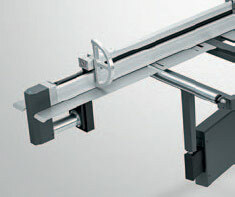 The large dumbbell rollers guide the moving table with absolute precision between the hard-chromed guide bars. Robust though it is, the table responds to even a light touch, gliding smoothly and securely as if on rails. And it retains this ease of movement even after decades of hard work, dust and dirt. Do you require a Fixed Rear Table Extension? On/off switches on sliding table? Please note this is not available in conjuction with the TIP-SERVO-DRIVE (below). 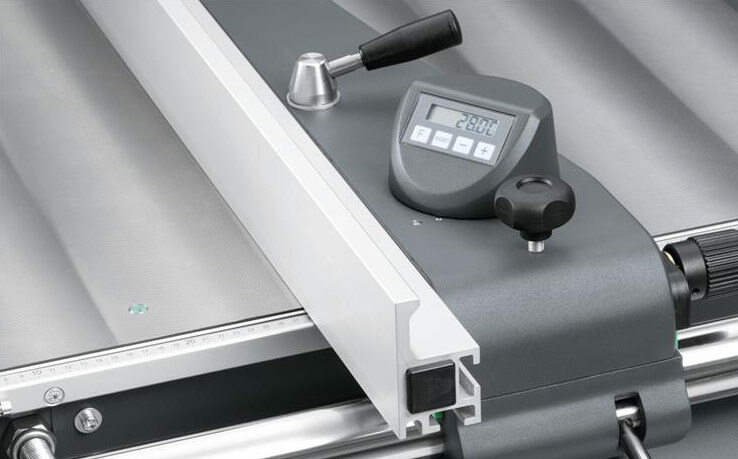 The motorised servo drive for the sliding table moves even the heaviest of workpieces back and forth easily during cutting, taking the physical strain off your body – and your back in particular. The electronic sensor control handle responds to the lightest of touches, so you can maintain an upright and relaxed posture throughout the cutting operation. The TIP-SERVO-DRIVE cannot be used in combination with the on/off switches on sliding table option or the vacuum clamping in sliding table option. Comes with electronic vertical and lateral adjustment, programmable scorer blade height, rapid deploy and retract and 0.75 kW (1 HP) motor (8,200 rpm). For retrofitting only to machines designed to accommodate a scorer unit. With motorised vertical, lateral and cutting width adjustment, including saw blade, programmable scorer blade height, rapid deploy and retract, saw blade width display and 0.75 kW (1 HP) motor (8,200 rpm). For retrofitting only to scorer-unit-ready machines. The scorer ensures chip-free undersides when working with laminated panels. The RAPIDO system makes adjusting the cutting width straightforward and enables this step to be completed in no more than three minutes. This can save you up to 30 minutes as compared with conventional scorer systems because it does away with the tedious process of mounting two-part scorer blades with spacer disks entirely. 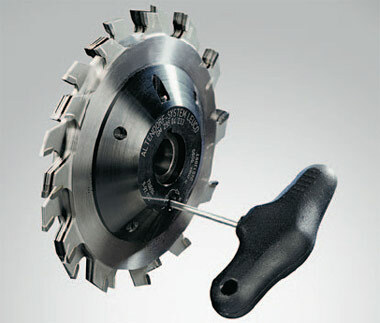 Adjustment is continuous and precise, so the RAPIDO can be fine-tuned to match any main blade. Range: 2.8 – 3.8 mm. Particularly energy-efficient LEDs render the hazard area around the scorer highly visible. 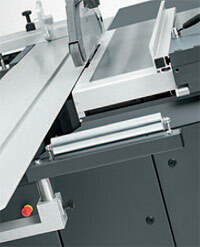 There are three rip fence choices available for the Altendorf F45, each offering unsurpassed precision. The easy, manual, precision fine adjustment makes for great accuracy. Digital cutting width display for the rip fence with manual fine adjustment. Our automated precision five-point recirculating ball screw system. Having selected the Manual Rip Fence with precision fine adjustment above, which cutting width do you require? Having selected the DIGIT X digital cutting width display for the rip fence above, which cutting width do you require? Having selected the CNC Rip Fence above, which cutting width do you require? Please make your selection of fence below. Provides precision cuts on workpieces of different lengths and formats. This patented Altendorf fence can make both square cuts and mitre cuts. Accurate and wear-free, this system features a robust locking mechanism. Which Crosscut Fence with fixed 90 degree angle? The crosscut fence with fixed 90° angle allows precision cuts on workpieces of different lengths and formats. Models with DIGIT L (pictured) offer 1/10 mm accuracy when setting the length dimension. The display shows all stop settings applied. 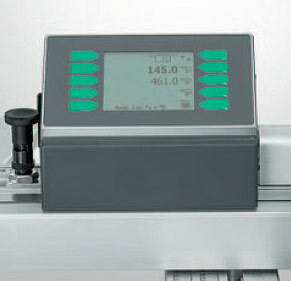 The central measuring and display unit calibrates the entire system in one operation. High-capacity batteries and a charger are included. This accessory is well worth considering if you plan to be sizing large and heavy workpieces of up to 250 kg. 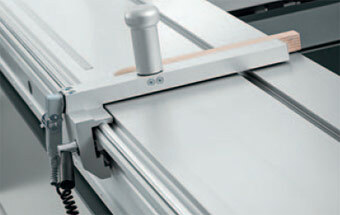 Recommended floor rail: flat steel, 10 x 60 mm (length = 2x table length + 500 mm). The floor rail is to be provided by the customer. This option makes it easier to cut longer/wider workpieces and increases the width of the support area for the manual crosscut fence. This patented Altendorf fence, with integral length compensation, can make both square cuts and mitre cuts. The model with DIGIT L (pictured) offers 1/10 mm accuracy when setting the length dimension. The display shows all stop settings applied. 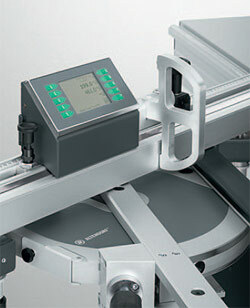 The central measuring and display unit calibrates the entire system in one operation. High-capacity batteries and a charger are included. The DIGIT LD also displays the angle digitally, enabling a level of precision of +/− 1/100°. The length dimension is calculated automatically as a function of the mitre angle. With integral length compensation. Including two flip stops and fine adjustment. This option makes it easier to saw longer/wider workpieces and increases the width of the support area of the cross-cut-mitre fence. It extends to a distance of 650 mm. Which Parallelogram Cross Slide (PQS)? Accurate and wear-free, this system features a robust 90° locking mechanism that ensures the right-angle position is absolutely repeatable. Developed specifically for the new parallelogram crossslide (PQS), the DIGIT L display unit model (90 mm diagonal) shows the distance to all stops digitally at the same time. Length compensation is straightforward once the fence has been set to the required angle. The fine adjustment of the distance to the stops is accurate to 1/10 mm and the angle is displayed as in the standard parallelogram cross slide. This reduces set up time to an absolute minimum. The high-capacity batteries can be recharged very quickly using the integral charger provided. The DIGIT LD model (pictured) displays the angle digitally, enabling a level of precision of +/− 1/100°. The length dimension is calculated automatically as a function of the mitre angle. Including two flip stops and fine adjustment of the angle. 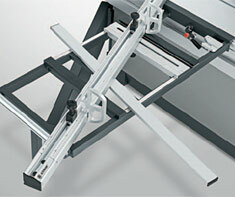 The fixed cross slide extension (up to 650 mm) with two separate supports makes it easier to saw wider/longer workpieces. The CNC crosscut fence UNO 90, which is fixed in the 90° position, makes it possible to complete both square cuts and mitre cuts with great precision. The flip stop has a maximum travel of 1 900 mm. If greater length is required, the extension supplied can be fitted manually to give a maximum dimension of 2,900 mm. This fence features two CNC stops with a maximum travel of 3,500 mm. It is fixed in the 90° position. Workpieces can be positioned against either side of the fence. The CNC crosscut fence DUO 90 is not compatible with the F45 ProDrive control unit. The DUO Flex fence can be angled manually by up to 47° for easy and convenient square cut and mitre cuts. It includes automatic length compensation and two motorised flip stops (travel to 3,500 mm). It is not necessary to lift the fence to switch between the front and rear positions on the cross slide. Workpieces can be positioned against either side of the fence, which makes it possible to complete compound mitres and mitre cuts at acute or obtuse angles in a single operation. 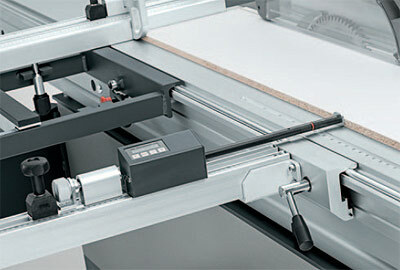 The CNC crosscut fence DUO Flex is not compatible with the F45 ProDrive control unit. 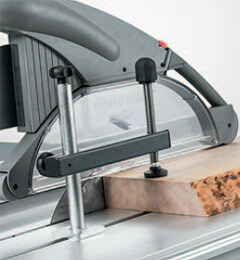 The cross slide extension makes it easier to saw wider/longer workpieces. Total extension to 650 mm. Do you require a Double-Sided Mitre Fence? Three models area available, each with a few choices of stop length. DUPLEX fences make mitre cuts at any angle between 0 and 90° with speed and precision. Offering the same functionality as the DUPLEX plus a digital angle display. Digital angle display and digital length display for adjustment, automatic length compensation. Which DUPLEX D Mitre Fence? Which DUPLEX DD Mitre Fence? the alternative to the pneumatic clamp. The manual quick-action clamp can be positioned on the sliding table easily and is equally easy to fix in place, ensuring the workpiece is reliably retained on the table and against the crosscut fence. It has a clamping height of up to 200 mm and provides extra safety at very little extra cost. 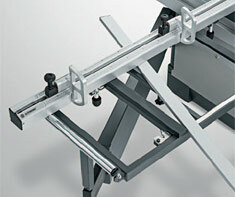 This clamp secures the workpiece in place on the sliding table. Activated by radio remote control, the quick-action clamp exerts a clamping force of up to 1,000 N to securely retain the workpiece against the crosscut fence. It can clamp workpieces up to 170 mm thick. Available with one or two clamping units. Pneumatic connection to be provided by customer (6 bar). 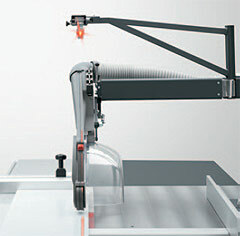 The laser cutting line marker shows the cutting line clearly for all cut lengths, which is useful when trimming or cutting marked jobs such as steps. Use it to save both time and materials. 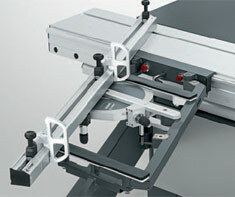 Altendorf is the first in the world to apply proven vacuum clamping technology to sliding table saws. The system, which is integrated into the sliding table itself, has at its heart a powerful vacuum pump that generates a vacuum via pairs of suction grippers arranged in the sliding table. 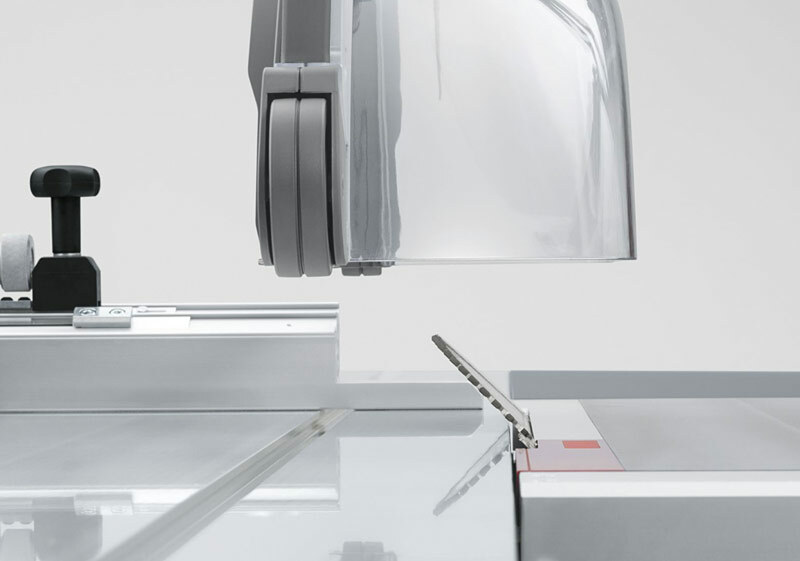 The various suction zones positioned along the length of the sliding table can be activated individually at the touch of a button, allowing the vacuum to be matched optimally to each workpiece. Panels of wood, plastic and non-ferrous metals remain securely in position on the sliding table throughout even complex cuts such as angles, long mitres and cuts to an outside dimension. Another touch of a button is all it takes to release the workpiece. Vacuum clamping improves reliability, precision and convenience and helps to eliminate manual operating errors. All table lengths feature the same five pairs of suction grippers. Each pair can be activated separately. Additional pairs of suction grippers are available on request. Not compatible with TIP-SERVO-DRIVE. This is an ideal solution for securely retaining workpieces of up to 80 mm thick, making it particularly useful when working with long and thin materials such as veneers. It comes in two separately-controlled pieces. A 6 bar pneumatic connection is required. The practical toolbox is a closable container capable of holding up to six tool carriers (maximum saw blade diameter 550 mm) ready for use. 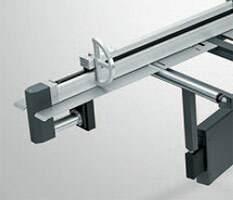 This option requires a minimum sliding table length of 3,000 mm. The basic toolbox includes 4 saw blade carriers. The STEG second support makes sizing large panels more straightforward for the user. Mounted on the eye-level control panel, the clip board allows you to attach your cutting lists so you have your ongoing jobs in view at all times. 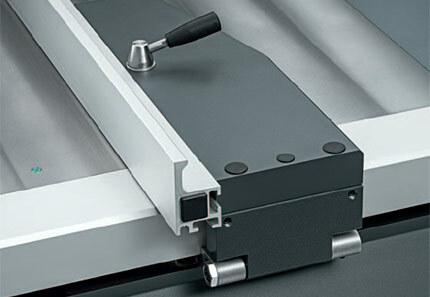 The 300 mm-wide infeed support roller is particularly useful when cutting longer workpieces against the rip fence. It folds away under the sliding table (minimum length 3,000 mm) when not required. Used in combination with the crosscut fence, the PALIN makes it possible to complete parallel and conical cuts in long, narrow workpieces with absolute accuracy. The measuring system butts against the side of the workpiece rather than the end, so no cutting length is lost and workpieces of differing lengths can quickly be cut exactly parallel without the PALIN having to be moved. The PALIN can be used as an additional workpiece support too if the measuring system is removed. Also available is the PALIN D model, which offers digital measurement display and fine adjustment. Use of a coolant spray device is recommended when working with plastics with a low melting point and for certain light metal alloys. 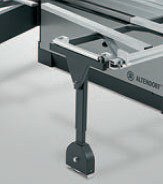 Your Altendorf will cut nonferrous metals and plastics cleanly, with sharp contours, to within a tenth of a millimetre. Configure your Altendorf F45 opposite and complete your details below to receive a quick quote back from R&J Machinery. The Altendorf F45 ProDrive control unit, which swivels where you want it, offers unprecedented ease of use, clarity, safety and convenience. 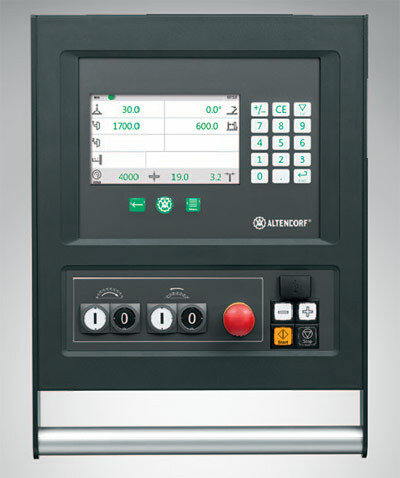 This basic control unit already provides control of all four axes. All values and functions are displayed clearly on the screen, which has a 90 mm diagonal. The green keys give you access to the following functions: saw blade height and tilt (up to 46° to both sides) plus, depending on machine specification, motorised rip fence, motorised crosscut fence, scorer and VARIO (infinitely variable speed control between 2,000 and 6,000 rpm). The white keys are used to enter the numerical values. Obviously the control unit can only control the options you’ve chosen, so make sure you choose precisely the configuration you need for your Altendorf. The new F45 EvoDrive has a 7" touch screen with separate keyboard for entering numerical values. It can control up to four axes, including saw blade tilt to either side. What distinguishes it from the F 45 ProDrive is its pre-installed app lication technology: the F 45 EvoDrive defines, for example, inside and outside dimensions auto matically from the material thickness data supplied. You also benefit from grooving, incremental dimension and bevel rip features, which should simplify your work considerably – as, indeed, should the compound mitre function and the tool management system. The F45 EvoDrive lets you store 999 programmes for rapid retrieval via the keyboard too. The green navigation buttons below the screen allow you to move between functions, access the main menu or go back to the previous page. You can also adjust the display to suit different ambient lighting conditions – dark background or light background – so you always have a good view of everything you need. Try the F45 EvoDrive and discover how we have already done much of the hard work for you! 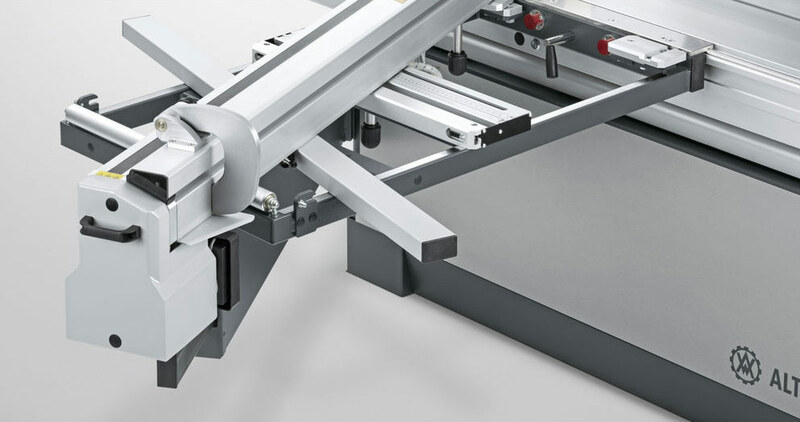 The Altendorf F45 ElmoDrive incorporates the most advanced and comprehensive control technology in existence for sliding table saws. Positioned at eye level, it combines optimal ease of operation with practical and ergonomic operation. 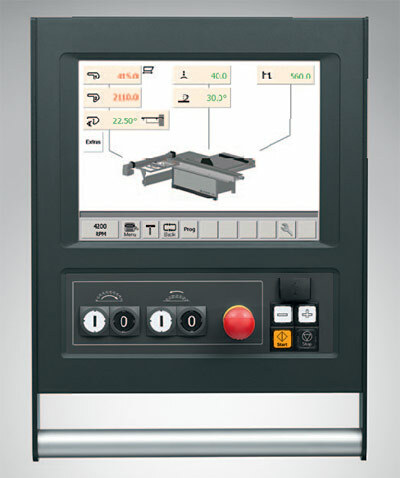 The calculator, geometric shapes, compound mitre and tool management functions are easily accessed and clearly presented on the 12" touch screen. The Altendorf F45 ElmoDrive of course gives you motorised control of all axes and allows you to tilt the saw unit to either side. The lower part of the display can be used to store functions you return to regularly (desktop function) for even more efficient operation. 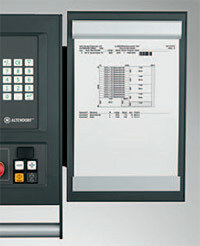 The F45 ElmoDrive is the only control unit that can be linked with a cut optimisation package. All in all, nothing comes close to the F45 ElmoDrive for control technology. Day after day. The ability to tilt the saw unit up to 46° to either side makes the F45 an even more versatile cutting machine. It saves time too: there is no need to adjust the extraction hood, which simply moves with the saw unit, and the F 45 completes the entire 90° movement, from full tilt on one side to full tilt on the other, in just 12 seconds. One of the main applications for the two-way tilt function is the sawing of internal mitres, which can be done easily and safely using the crosscut fence. Just as straightforward are simple bevel cuts and compound mitres. It saves time too: there is no need to change the extraction hood, you simply slide it between the left and right tilt positions. 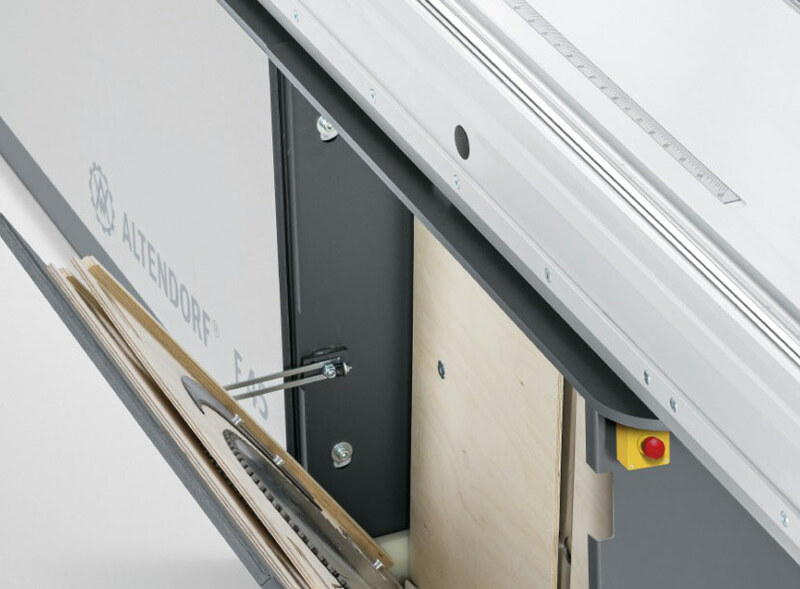 The new Altendorf saw unit features impressively robust tilt quadrants incorporating the traditional Altendorf tongue-and-groove connection system too, enabling it to tilt easily and with absolute precision just as you would be entitled to expect. The standard drive for this unit is a 5 kW (6.8 HP) motor with infinitely variable speed adjustment (VARIO, 2,000 – 5,000 rpm), but a more powerful 6.5 kW (8.8 HP) motor is available as an option. The synchronous servo motors fitted are up to 15% more efficient than conventional alternatives with a power reserve of up to 120%, which means peak power points of 11 kW for the 5 kW motor and 15 kW for the 6.5 kW motor. Setting the fence manually is easy; the precision fine adjustment makes for great accuracy. The hard-chromed round bar system ensures the fence moves smoothly. The rip fence can be swung away below table level in one action when preparing to divide large panels. Digital cutting width display for the rip fence with manual fine adjustment. This electronic measuring system ensures rapid and precise adjustment of the rip fence. Recurring dimensions can be reproduced exactly and checked on the DIGIT X display. 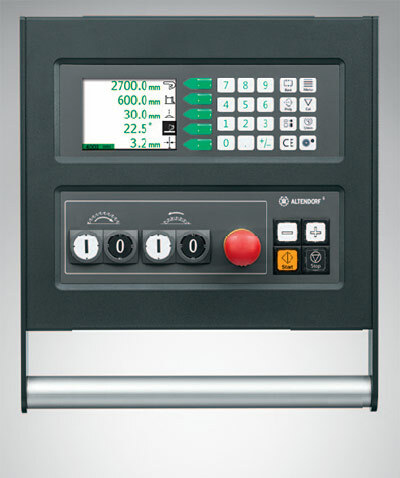 The correction for the rip fence position is shown digitally on the machine control unit's LCD display when working with the saw blade tilted. The system is not subject to wear and is unaffected by dust. Dimensions are corrected automatically when the fence is switched between the upright and the flat position. The CNC rip fence has a traverse speed of 250 mm/sec. and an accuracy of +/–1/10 mm. The high-precision five-point recirculating ball screw system is low maintenance and, along with the motor, is well protected by its integration into the aluminium profile. The fence detects its position automatically, especially in the danger area around the saw blade, and has an emergency cut-out to prevent the risk of crushing. Dimensions are corrected automatically when the fence is switched between the upright and the flat position or when working with the saw blade tilted. The crosscut fence with fixed 90°° angle allows precision cuts on workpieces of different lengths and formats. The fence can be easily slid from the front to back position without lifting. 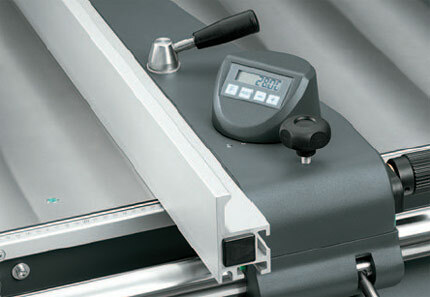 The basic specification includes stops to 3,200 mm, adjustable using the graduated scale. This patented Altendorf fence, with integral length compensation, can make both square cuts and mitre cuts. The mitre angle can be adjusted continuously over a range of 49° with a graduated scale and the robust, free-sliding zero-play flip stops can be positioned individually at any distance up to a maximum of 3,500 mm. The outer stop docks into the roller-stabilised telescopic extension for distances longer than about 1,700 mm. When cutting mitres, length compensation means measurements to the stops are accurate whatever the angle. Simply slide the fence to the desired angle, line up the pointer with the same angle on the length compensation scale, then set the flip stop to the length required. Accurate and wear-free, this system features a robust 90° locking mechanism that ensures the right-angle position is absolutely repeatable. The fence can be angled by up to 47° in either direction. The integrated digital display shows the angle with an accuracy of 1/100° for optimal precision. Also included is length compensation, which is simply set using a scale when the fence is angled. Stops to 3,500 mm. 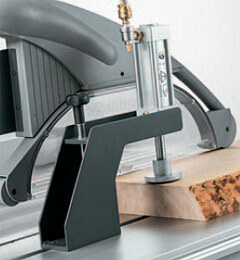 This option gives you the ability to motorise the stops on the left hand side of your panel saw. Adding the facility to automate the crosscut fence drastically decreases setting up time and hugely increases your level of accuracy. DUPLEX fences make it possible to make mitre cuts at any angle between 0 and 90° with speed and precision. At 45° a mitre cut can be made on both sides of the workpiece without mooving the fence. Dimensions are set using a magnifier, a measuring scale and a length compensation scale for frequently recurring angles. All DUPLEX fences can be positioned anywhere along the entire length of the sliding table. 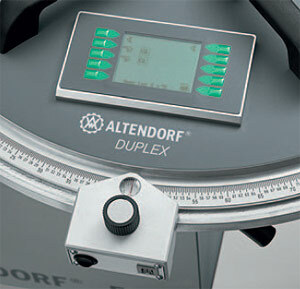 The DUPLEX D provides the same functionality as the DUPLEX plus a digital angle display that shows values to an accuracy of 1/100°. 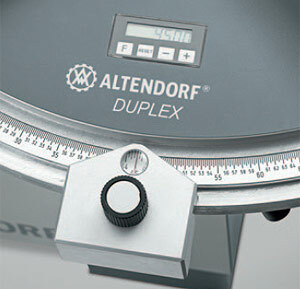 Digital angle display and analogue length scale for adjustment, integral length compensation for frequently recurring angles. Batteries included. 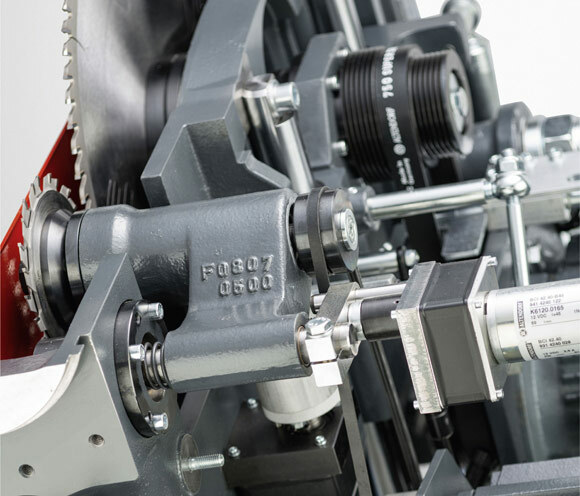 The DUPLEX DD, which has been patented worldwide, not only eliminates tedious calculations and measurement checking completely, but even removes the need for test cuts. 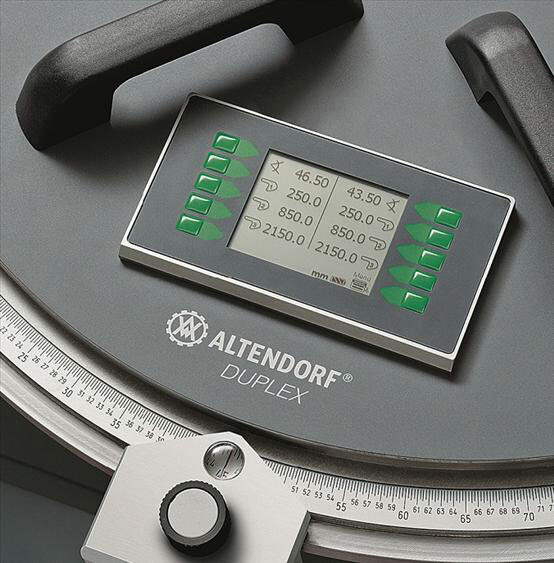 Developed exclusively by Altendorf, the high-precision electronics in the DUPLEX DD calculate the length dimension as a function of the mitre angle on both sides of the fence and display both values digitally. Digital angle display and digital length display for adjustment, automatic length compensation. Batteries included.